Photograph of the Kedareshvara Temple at Prakasha, taken by Henry Cousens in the 1880s-90s. Prakasha is small town located in northern Maharashtra. It is home to a twin-domed temple which has a round tower in front and is described in the Bombay list p. 56: ''[The temples]...are fine handsome imposing buildings, but they are all more or less modern and of little interest.'' 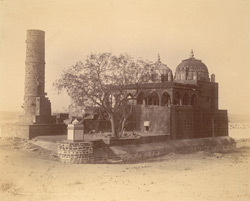 This photograph was taken as part of a tour of western India that Cousens undertook out in the 1880s and 1890s. This was undertaken with the intention of recording places and structures of historical interest under the title 'The Archaeological Survey of Western India.' The year he visited Taulai, Cousens also made extensive studies of the temples found at towns like Akola, Nagapur, Sinnar and Changdeva to name a few examples.